A great wireless router is an essential element of tech life, whether you’re building out a smart home or you just want the best experience streaming music and video at home. We pick the best models here, because even those of us fortunate enough to have ethernet drops in every room have devices—smartphones and tablets, for instance—that depend on Wi-Fi to connect to the home network if not the internet. Twin and sometimes conflicting demands for high performance and ease of use are powering a thriving and rapidly evolving market. Innovation is one of the biggest upsides of this dynamic, and confusion its biggest downside. Today’s hero could be tomorrow’s has-been, as established brands like Linksys and Netgear try to one-up each other while simultaneously fending off new challengers such as Eero and Luma. But it’s those challengers who have innovated the most, starting with Eero, the first manufacturer to bring mesh networking to the consumer router market. The home Wi-Fi router market can be divided into two broad categories: traditional routers designed to cover an entire home, sometimes with the aid of wired access points or wireless range extenders, and whole-home Wi-Fi systems that consist of a base station with one or more satellite nodes. Our most recent router coverage has focused on the latter, so our initial picks will be in that category. We’ll circle back later and make recommendations for traditional routers as well. Scroll down a bit and we’ll discuss the features you should look for in a wireless router and explanations of some of the jargon you’ll encounter when you shop for one. Updated July 10, 2018 to add our review of the TP-Link Deco M9 Plus. While it does combine a fast Wi-Fi router with a smart home hub, and it includes strong antivirus and parental control features, the Deco M9 Plus didn't knock the Samsung Connect Home of its perch as our favorite router for smart home enthusiasts because it doesn't have a Z-Wave radio onboard (it does have ZigBee and Bluetooth radios). When deployed with a single satellite, the Netgear Orbi is an excellent choice for moderate-sized homes, delivering higher TCP throughput than mesh routers operating with three nodes. The secret to the Orbi RBK50’s success is Netgear’s dedicated 4x4, 1,733Mbps radio used for data backhaul between the router and its satellites (the RBK50 comes with one satellite, which Netgear says is sufficient to blanket 5,000 square feet). We also like the fact that the Orbi router has a built-in three-port ethernet switch (the satellite has a four-port switch), because those ports provide so much flexibility in terms of connecting other devices to your network, be it a NAS box for media streaming and data backup, a network printer that doesn’t support Wi-Fi, or an older ethernet-only A/V receiver in your entertainment center. The Orbi RBK50 is not the least-expensive solution at $400, though, and it’s overkill for smaller spaces. We’ll have reviews of the scaled-down Orbi RBK40 and RBK30 soon. The Linksys Velop is one of the best true mesh-network routers we've tested, but many Wi-Fi enthusiasts will still prefer a more conventional model. Like Netgear’s Orbi RBK50, the Linksys Velop is a tri-band router that dedicates one Wi-Fi channel to data backhaul, selecting the least-congested channel on the fly. Unlike the Orbi, however, the Velop’s maximum per-channel bandwidth is 867Mbps (the Orbi uses a fixed channel for backhaul with 1,733Mbps of bandwidth). Two Velop nodes proved to be the sweet spot in blanketing our 2,800-square-foot test home with Wi-Fi, which would save us $50 over the cost of an Orbi RBK50. TP-Link’s Deco M5 isn’t the absolute fastest whole-home Wi-Fi system on the market, but it delivers very good performance and a strong set of features. TP-Link’s Deco M5 is a mesh Wi-Fi system, which makes it distinctly different from Netgear’s hub-and-spoke topology (scroll down for deeper explanations of those terms). 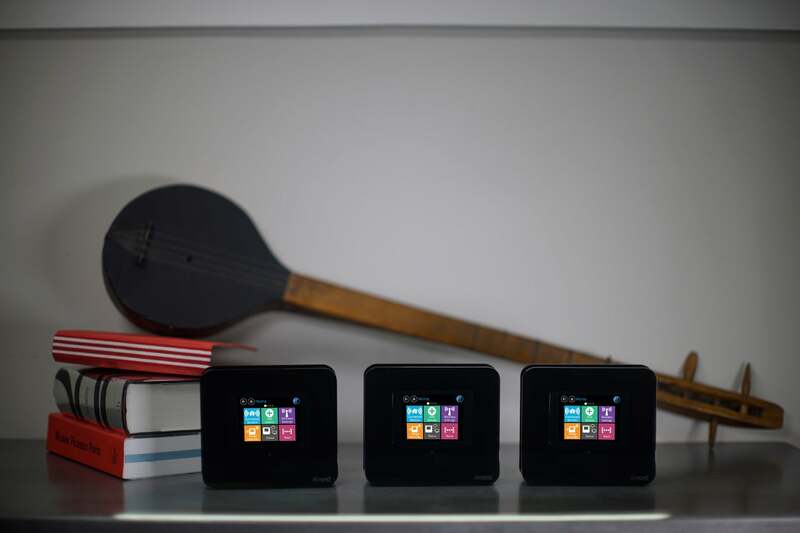 All Deco M5 units are identical, but one gets configured as a router and the others as mesh nodes. If your client is close to the router, it will communicate with it directly. If the client is closer to a node, it will communicate with that and the data packets it sends and receives will hop from one node to the next until they reach the router. Since the same channel is used for data backhaul, a dual-band mesh network generally delivers less bandwidth than a hub-and-spoke system or a tri-band mesh router that has a dedicated backhaul channel. Samsung’s Connect Home isn’t the best mesh router, nor is it the best smart-home hub, but it is the best mesh router with an integrated smart-home hub. The Connect Home bested our previous pick, Securifi’s Almond 3 router, by including a Z-Wave radio in addition to ZigBee and Bluetooth support. But Samsung’s effort to make this product appealing to the broadest possible audience takes away some of the power and flexibility of the SmartThings platform that this router incorporates. While our picks above focus on whole-home Wi-Fi systems for the time being, this guide will help you sort through the facts, figures, and specs associated with all types of Wi-Fi routers to help you determine which type best fits your specific needs. And that’s really the first decision you need to make: Do you want a traditional router, a Wi-Fi system, or a dual-purpose router that can also perform as a smart home hub? Wi-Fi systems, as we’ve already explained, blanket your home with Wi-Fi by using multiple nodes or satellites. They can be very effective, but they might not be the right choice for gamers because they can introduce lag as the data packets hop from one node to the next. You can get around this by hardwiring your gaming PC directly to the router (plug a switch into the router’s LAN port if you want to hardwire more than one device to it). You could also try hardwiring the wireless nodes to the router so they use an ethernet cable for data backhaul. High-end conventional routers offer high-performance features you won’t find in whole-home Wi-Fi systems. 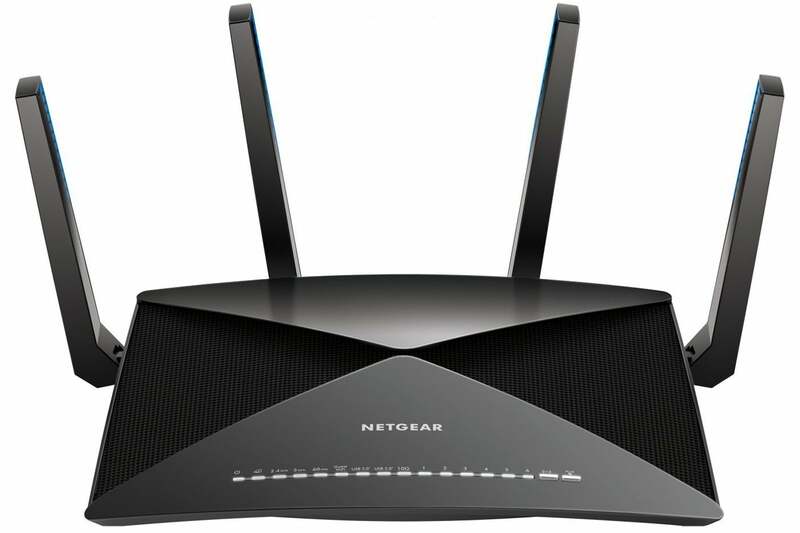 The Netgear Nighthawk X10, for instance, has a 10Gbps ethernet port for network storage. Traditional routers tend to offer more granular control over your network, with tweakable settings for features such as QoS (Quality of Service), port forwarding, VPNs, FTP servers, and much more. Most have built-in ethernet switches (four ports or more), so you can hardwire network devices directly to the router. And they typically have one or two USB ports that can be used to share a printer or USB storage with all the devices on the network. I’d venture to say that most people who buy traditional routers never touch most of those settings or even use many of their advanced features; they buy them because higher-end routers deliver faster Wi-Fi performance. A dual-purpose router with smart home features will have a ZigBee or Z-Wave radio that can communicate with sensors, smart lights, smart entry locks, motorized window shades, and lots of other devices that use the same protocols. Some smart home devices use Bluetooth, but all the routers with Bluetooth radios that we’ve seen so far use that protocol only for initial router setup. Securifi’s Almond router series is the most well-known example of a dual-purpose router, although Samsung has announced a Wi-Fi mesh router that will integrate a SmartThings hub that supports all three protocols (ZigBee, Z-Wave, and Bluetooth). Securifi’s Almond 3 router can also perform as a smart home hub, thanks to the presence of a ZigBee radio that can talk to sensors, lighting controls, and more. You’ll encounter a thicket of jargon when you shop for a new Wi-Fi router. We’ll explain some of the most common terms you’ll encounter (in alphabetical order). AP steering A mesh-network router that supports AP steering will automatically direct its wireless clients to connect with whichever access point (AP) offers the strongest connection back to the router (and thus to the internet). Backhaul The side of a network that carries data packets back to the router and out to the internet. Some tri-band whole-home Wi-Fi systems, including the Netgear Orbi and Linksys Velop, dedicate an entire wireless channel to backhaul. You can also set up a wired backhaul by connecting the access point to the router using an ethernet cable, but that would require drilling holes in your walls and pulling the cable through, a job most people are reluctant to tackle. Band steering A router with this feature can detect if a client device is dual-band capable (i.e., the client is outfitted with a Wi-Fi adapter that can operate on either the 2.4- or 5GHz frequency bands). 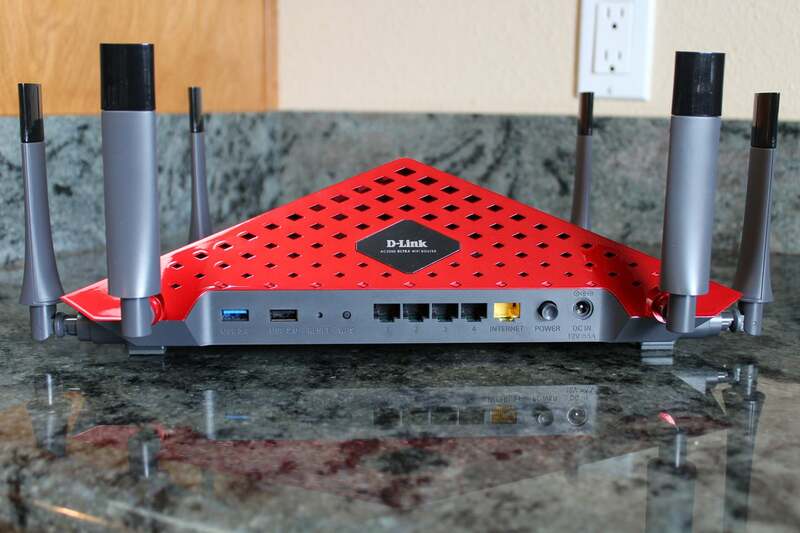 The router will automatically push dual-band clients to connect to its least-congested network, which is usually the one operating on the 5GHz frequency band. 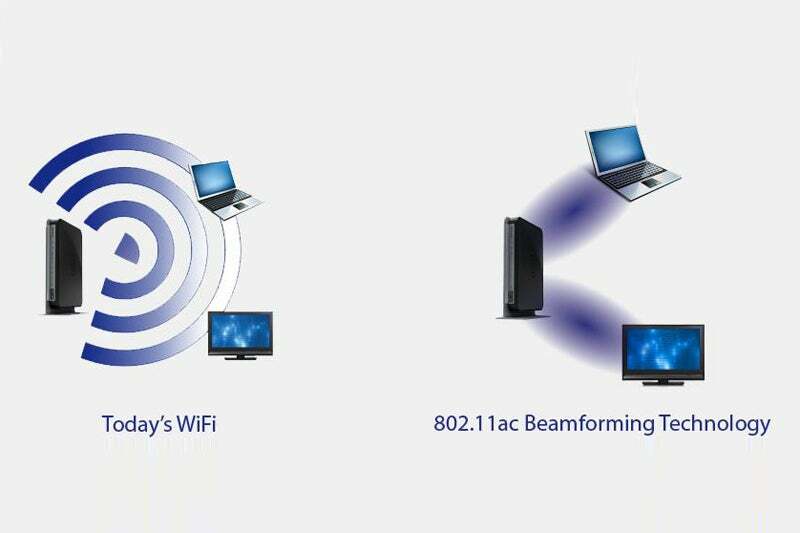 Beamforming An optional feature of the 802.11ac Wi-Fi standard that improves wireless bandwidth utilization by focusing the radio signals so that more data reaches the client and less radiates into the atmosphere. Click here for a more in-depth explanation of beamforming. A beamforming router knows where its clients are located in physical space and can pack in more data by focusing the radio signals they exchange. Dual-band vs. tri-band A dual-band Wi-Fi router operates two discrete networks, one on the 2.4GHz frequency band and a second on the less-congested 5GHz frequency band. Some tri-band routers split the 5GHz frequency band, using the lower channels to operate one network and the upper channels to operate a third network. Other tri-band routers operate discrete networks on the 2.4- and 5GHz bands, and a third network on the 60GHz band. ethernet ports A router must have at least two hardwired ethernet ports (either 100Mbps or gigabit per second). One (the WAN, or wide area network) connects to your broadband gateway (a cable or DSL modem, for instance). The other (a LAN, or local area network) connects any hardwired client. Most whole-home Wi-Fi systems have two auto-configuring ports that become WAN or LAN based on what gets plugged into them. Most traditional routers have a dedicated WAN port and an integrated ethernet switch with four or more ports. You can increase the number of ethernet ports available on your network by plugging an ethernet switch into one of the LAN ports. You can do the same with the access points in a whole-home Wi-Fi system. High-end conventional routers, such as the D-Link DIR-890L, have four-port ethernet switches and USB ports. Guest network This is a virtual network that gives your guests access to the internet while blocking access to your own computers, NAS boxes, and other network clients. Hub-and-spoke vs. mesh network In a hub-and-spoke network topology, each wireless access point exchanges data packets directly with the router. A wagon wheel makes for a good visual metaphor here. In a mesh network, wireless access points that are distant from the router can exchange data packets with their closest AP neighbor until the packets reach the router (and vice versa). In this instance, you might visualize a fishing net; or perhaps abstractly, a firefighter’s bucket brigade. MU-MIMO The acronym stands for multiple user, multiple input/multiple output. MIMO describes a method of sending and receiving more than one data signal using the same radio channel. This is accomplished using a technique known as spatial multiplexing. In its original implementation in routers, client devices had to take turns communicating with the router, round-robin style. The switching happens fast enough that the interruptions are imperceptible, but it reduces the overall transmission speed. This is known as SU-MIMO (single-user MIMO). As you’ve probably guessed, MU-MIMO lets multiple client devices communicate with the router at the same time without interruption, significantly increasing transmission speed. Both the router and the client must support MU-MIMO for the scheme to work. 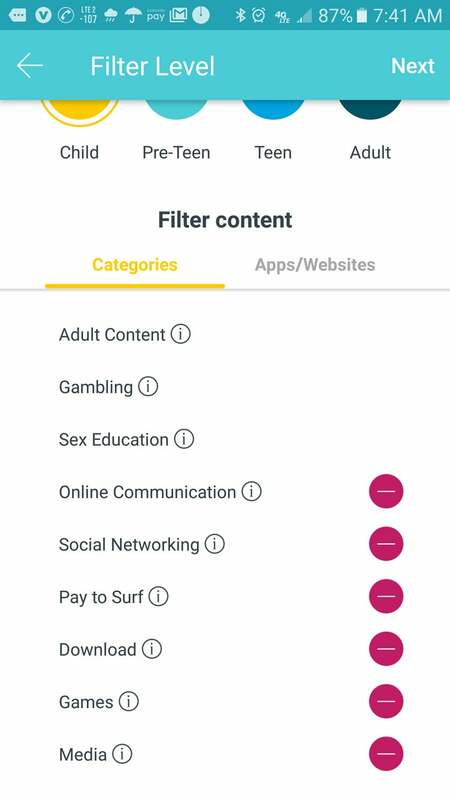 A parental controls feature lets you filter the types of content that client device can access from your home network. Parental controls The internet can be an unpleasant and even dangerous place for children to visit. Router-based parental controls promise some protection by restricting where a person can browse and what they can do while they’re online. Such controls can also restrict the hours that a device is allowed to be online—at least while the device is on that router’s network. Methods and practices—and effectiveness—vary widely. I’ve yet to see a system that’s better than just having an open and frank dialog with your kids, but that’s just my opinion. Quality of Service (QoS) This concept describes a router’s ability to identify different types of data packets traveling over the network and then assign those packets higher or lower priority. You might want your router to give network traffic such as streaming video or VoIP (Voice over Internet Protocol) calls higher priority than file downloads, for example, because the former don’t tolerate interruptions. Waiting a little longer for a file to download is vastly preferable to watching a glitchy video. Spatial streams The multiplexed signals described in MU-MIMO above are called spatial streams. The number of radios and antennas in the router determine how many spatial streams it can support; and the method used to encode the data, combined with the channel’s bandwidth, determines how much data can fit within each stream. An 802.11ac router using channels that are 80MHz wide can deliver throughput of roughly 433Mbps per spatial stream. Spatial streams operate in parallel, so adding them is akin to adding lanes on a highway. Where a 2x2 802.11ac router (two spatial streams to transmit and two to receive) can deliver throughput up to 867Mbps, a 4x4 802.11ac router can deliver up to 1,733Mbps. These are theoretical numbers, however; they don’t take into account protocol overhead and other factors, so you’ll never see real-world performance that high. Wi-Fi speed ratings Vendors commonly market their 802.11ac routers (and 802.11ac Wi-Fi client adapters) by combining the throughput numbers for each of the router’s networks. A dual-band router capable of delivering 400Mbps on the 2.4GHz frequency band and 867Mbps on the 5GHz frequency band might be described as an AC1300 router (rounding up from 1,267, naturally). You’ll never experience 1,300Mbps (or even 1,267Mbps) of throughput, of course, because it’s not possible to bond the 2.4- and 5GHz networks together. But the classifications at least provide a point of comparison. Updated August 22, 2017 to include our review of Samsung’s Connect Home router/smart-home hub combo. While it’s not perfect in either role, it has displaced Securifi’s Almond 3 router as our top recommendation for smart-home enthusiasts. TP-Link’s Deco M9 Plus delivers fast mesh networking, network-level antivirus, and a smart home hub all in one pretty package. It’s not the fastest mesh network system we’ve tested, but it is very elegant. It’s also expensive. It's not as fast as the new tri-band mesh routers that offer a dedicated network for data backhaul, but it is a solid value. It's not the fastest Wi-Fi mesh router we've tested, but its smart home features make it a great value for DIY enthusiasts. Chopping one spatial stream off Netgear’s dedicated wireless backhaul had a significant impact on its performance.